F. Paul Wilson, a practicing physician as well as the bestselling author of the Repairman Jack series, turns his attention to the day after tomorrow and shows us how genetic engineering might change the world. Just a few hundred genes separate humans from chimpanzees. Imagine someone altering the chimp genome, splicing in human genes to increase the size of the cranium, reduce the amount of body hair, enable speech. What sort of creature would result? "Sims "takes place in the very near future, when the science of genetics is fulfilling its vaunted potential. It's a world where genetically transmitted diseases are being eliminated. A world where dangerous or boring manual labor is gradually being transferred to "sims," genetically altered chimps who occupy a gray zone between simian and human. The chief innovator in this world is SimGen, which owns the patent on the sim genome and has begun leasing the creatures worldwide. But SimGen is not quite what it seems. It has secrets . . . secrets beyond patents and proprietary processes . . . secrets it will go to any lengths to protect. Sims explores this brave new world as it is turned upside down and torn apart when lawyer Patrick Sullivan decides to try to unionize the sims. Right now, as you read these words, some company somewhere in the world is toying with the chimp genome. That is not fiction, it is fact. 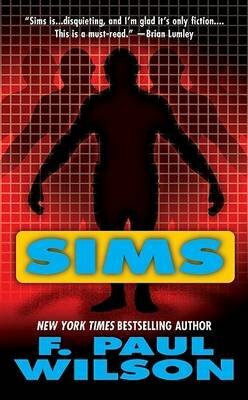 "Sims "is a science thriller that will come true. One way or another.